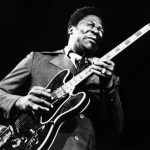 BB King was the living link to the great bluesmen of previous generations like Muddy Waters, Howlin’ Wolf and Willie Dixon. He was the teacher for another generation that included the likes of Eric Clapton, Stevie Ray Vaughan and Johnny Winter. And he will be a case history for every up and coming picker and grinner who masters single string note bending and hammer-ons for as long as The Blues is played. And that will be forever. Thank you BB for that magical night at the Wollman Rink at the Schaefer Music Festival a million years ago in 1969. You stole the show from Led Zeppelin. It still resonates. Thank you for all the shows at your club. Thank you for That’s Why I Sing The Blues and Hummingbird and So Excited and Big Boss Man and When Love Comes To Town. And thank you for being the greatest ambassador the Blues has ever had. You will be missed by millions.